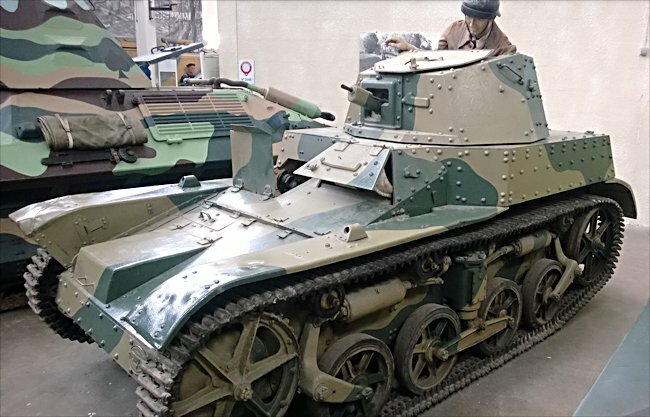 This French Churchill AMR 33 WW2 Light Tank can be found at the French Tank Museum in Saumur in the Loire Valley. The Museum is called Musée des Blindés ou Association des Amis du Musée des Blindés, 1043, route de Fontevraud, 49400 Saumur, France www.museedesblindes.fr . The word Blindés means armoured. 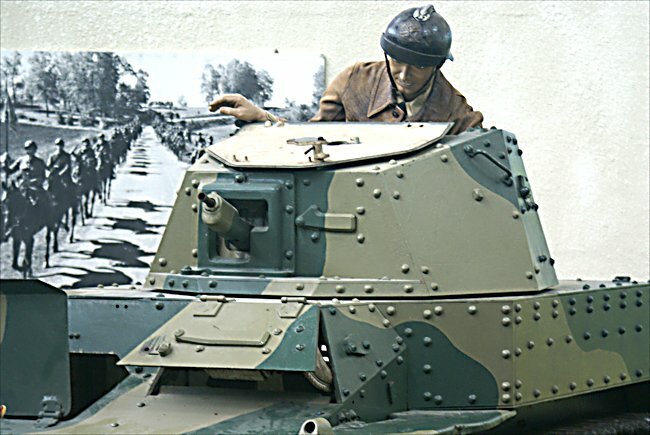 The full name of this light tank was "Automitrailleuse de Reconnaissance Renault Modèle 1933" which was shortened to "AMR 33" or sometimes it was designated "Renault VM". Although it was called a reconnaissance vehicle it could not be used as an effective scout as it was not fitted with a radio. The military thinking of 1933 was to have a large mass of AMR 33 light tanks clear the way of infantry in front of the slower medium and heavy tanks. By the 10th May 1940 and the invasion of France by Germany, these seven year old tanks were completely out classed by the German armoured vehicles and assault guns. Most of the losses of the French tanks during the invasion of France in May 1940 were caused by German Luftwaffe Stuka dive bomber attack, artillery bombardment, by mines or infantry anti-tank guns. There were very few instances where large numbers of German tanks encountered large numbers French tanks. This was mainly because the German tanks were in the spearhead of the blitzkrieg assault that was heading for the coast. The French tanks were used to attack the flanks of the armoured assault so most of their opposition was soft skin vehicles and anti-tank guns. The French AMR 33 light tank was effective in this role. It's machine gun could deal with German infantry. Its armour was just thick enough to provide its crew with protection from small arms fire. If it came across a German Panzer Mark II, III or IV tank its only option was to retreat. Many AMR 33 tanks were abandoned by their crew because of the poor logistical support. They ran out of ammunition and fuel. If the tank broke down because of a mechanical fault, there was no system to repair these vehicles near the front line.